This book provides a new, powerful twist to MIDAS technical analysis, a trading method developed by the late Paul Levine. The authors show how to employ MIDAS in trading, from recognizing set ups to identifying price targets. 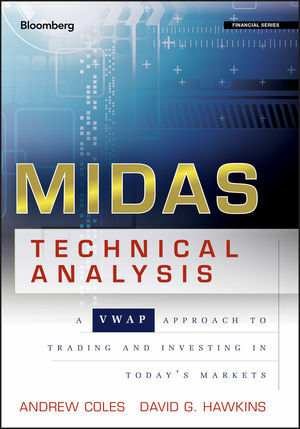 The book explains the basics of MIDAS before demonstrating how to apply it in different time frames. Further, it extrapolates how MIDAS can be used with other more conventional indicators, such as DeMark or moving averages. In addition to introducing new indicators that the authors have created, the book also supplies new computer codes. Andrew Coles, PhD, is an active trader running a private investment fund. He has a diploma in technical analysis from STA–UK and from the International Federation of Technical Analysts (IFTA). He is also a Certified Financial Technician (CFTe). He holds a master's and a doctorate and was a Postdoctoral Research Fellow of the British Academy.During his graduate and postdoctoral years, he worked at a number of institutions, including King's College (KQC) London, the Institute of Classical Studies, and Oxford University. He is the author of a previous book on the history and philosophy of science. David G. Hawkins is a successful full-time trader. He holds an MS in physics from Brown University, has taught physics at Roger Williams University, and has designed optical and ultrasound components for graphics, medical, and telecom systems. He presents on MIDAS and other technical analysis topics at AAII conferences. Biographical Sketch, Paul H. Levine (David G. Hawkins). PART I: STANDARD MIDAS SUPPORT AND RESISTANCE CURVES. CHAPTER 1 MIDAS and Its Core Constituents: The Volume Weighted Average Price (VWAP) and Fractal Market Analysis (Andrew Coles). CHAPTER 2 Applying Standard MIDAS Curves to the Investor Timeframes (David G. Hawkins). CHAPTER 3 MIDAS Support and Resistance (S/R) Curves and Day Trading (Andrew Coles). PART II: THE MIDAS TOPFINDER/BOTTOMFINDER. CHAPTER 4 The MIDAS Topfinder/Bottomfinder on Intraday Charts (Andrew Coles). CHAPTER 5 Applying the Topfinder/Bottomfinder to the Investor Timeframes (David G. Hawkins). PART III: THE LONGER-TERM HORIZON, OTHER VOLUME INDICATORS, AND BROADER PERSPECTIVES. CHAPTER 6 Applying MIDAS to Market Averages, ETFs, and Very Long-Term Timeframes (David G. Hawkins). CHAPTER 7 EquiVolume, MIDAS and Float Analysis (David G. Hawkins). CHAPTER 8 Putting It All Together (David G. Hawkins). CHAPTER 9 Standard and Calibrated Curves (David G. Hawkins). CHAPTER 10 Applying the MIDAS Method to Price Charts without Volume: A Study in the Cash Foreign Exchange Markets (Andrew Coles). CHAPTER 11 Four Relationships between Price and Volume and Their Impact on the Plotting of MIDAS Curves (Andrew Coles). CHAPTER 12 MIDAS and the CFTC Commitments of Traders Report: Using MIDAS with Open Interest Data (Andrew Coles). CHAPTER 13 Price Porosity and Price Suspension: The Causes of these Phenomena and Several Partial Solutions (Andrew Coles). CHAPTER 14 A MIDAS Displacement Channel for Congested Markets (Andrew Coles). CHAPTER 15 MIDAS and Standard Deviation Bands (Andrew Coles). CHAPTER 16 Nominal–On Balance Volume Curves (N-OBVs) and Volume–On Balance Curves (V-OBVs) (Andrew Coles). CHAPTER 17 Extensions, Insights, and New Departures in MIDAS Studies (Andrew Coles). APPENDIX A Programming the TB-F (David G. Hawkins). APPENDIX B MetaStock Code for the Standard MIDAS S/R Curves (Andrew Coles). APPENDIX C TradeStation Code for the MIDAS Topfinder/Bottomfinder Curves (Bob English).